The crack was petering out. What, thirty feet below, had begun as a tolerable protection “eater” now had become so thin that I could “get in” nothing larger than almost my smallest wire nut. It slipped into a little vertical crevice with rounded granite flanks about eight feet above my last pretty good piece. A few feet above the steepness relented a bit, but there the crack ended in a fine line that vanished at eye level into the featureless upper reaches of the quartz monzonite dome. We were in the high California desert in the Hall of Horrors at Joshua Tree National Monument. Our climb was “Lickety Splits,” a 5.7 on which I had found it difficult enough to reach my present stance. From here up it turned to steep friction with no further protection. I ventured a step up the slab, hands palming the rock seeking out non-existent crystals or pockets. Unaccountably my foot held. I tried another step, and another, and I began to feel almost secure until arriving at a point where the slope steepened again, almost imperceptibly. I tried another step—and froze. I looked up—eight feet to the final roundoff. And down—twelve feet to the little stopper and twenty to my last good piece. I felt pretty sure that I didn’t dare make the next few moves. The barely possible down-climb or the potential forty foot fall seemed unthinkable. What to do? After a few long minutes a rope-end snaked its way over the bulge above me and I gratefully tied it in to my harness. Then, from somewhere above, I heard “On belay!” and moved into the pitch. The moves seemed tenuous and scary but, really, not all that bad—I’ve stepped over harder. I felt vaguely as though I had cheated myself. A leader shrinks from the idea that he may not exhibit self-sufficiency in any difficulty. In this place, had we been alone, I am not sure what the outcome might have been. I suppose I would eventually have successfully braved the necessary moves—after all, only 5.7. At the top a suntanned mountain veteran of about forty-five greeted me who introduced himself as Jim (“Bobo”) Burwick, longtime Exum Guide in the Tetons, on a busman’s holiday with friends from Jackson. He seemed reassuring and pleasantly dismissive of my embarrassment for having had to bail out of my precarious situation. He asked my age (then 66) and expressed a lively interest in old climbers who had been around for much longer than he had. He invited me to come over to visit him and his friends at Ryan Campground that evening. I did that and we sat around his fire under the stars, downed a few beers, and talked of climbing in the Tetons. Outside Dornan’s store at Moose in Jackson Hole I tossed a bag of ice into the cooler in the trunk of our rental car and dropped the lid. For a fleeting moment, just before the lid slammed shut, I had a vision of the car keys lying inside on top of a sleeping bag. Instant panic! It was Saturday afternoon. It was four-thirty at the end of our last day in the Tetons and we were headed south to Salt Lake to catch the plane the next day. It had been a good trip—we had climbed Moran and the East Snowfields route on Teewinot. Brian (Fulton) emerged from the store, bags in his arms, and all but dropped them when I told him what I had done. What to do? On the pay phone at the door we called the rental agency in Salt Lake and they told us they could give us a key code for a local locksmith. However, “the guy who does the keys isn’t here yet; call again in a few minutes.” The nearest locksmith was in Jackson, twenty-five miles away. We called him. He would close at six. No. Sorry. Not open on Sundays. And, anyway, how could we get to Jackson without a car? Seized by even greater panic. We called back to Salt Lake. Long, agonizing waits on the line feeding quarters into the phone outside the store. “Well, um, yes there is.” And we explained our difficulty. Just barely before six the locksmith promised us our key. While waiting Jim drove us over to the library, walked straight to a side room, then to a shelf, and pulled down a book: “Ascents of the Grand Teton” by Leigh Ortenburger. Phil Gribbon and I had done the forty-seventh ascent of the East Ridge route. Back at Dornan’s we held our breath—the trunk popped open. “Bobo” Burwick had saved me again. In August 1957 I decided to go west alone to the Tetons. My new climbing friends went generally west in July but I could not arrange my vacation time earlier from Henry Dreyfuss Studio (the celebrated American industrial designer) in New York. Going alone with no high mountain experience seemed daunting at the time but I decided that not to go would be to give up a taste of new adventure for no good reason. I packed at 21 Jones Street and got Peter Pruyn to drive me to La Guardia. The week before at Camp & Trail on Canal Street, feeling very much the mountaineer I had not yet become, I purchased my first rope, carabiners, and some soft iron pitons. It excited me to heft and to coil and recoil the new laid rope, 120 feet of white 3/8 inch nylon, and to manipulate and to clip the forged iron into various of my brand new Bedayn aluminum ‘biners. I felt on the verge of an experience I could not have imagined even one year earlier upon having stumbled onto the Appalachian Mountain Club climbing training group in the Shawangunk Mountains (the ‘Gunks) the previous September. In Denver, with an introduction to some friends of friends (the Elrick’s, now long out of mind) I stayed a night. In the morning, in an effort to save money, I found and arranged for a “drive-away” to Utah—the company would even pay for the gas. They gave me a used Rambler station wagon and, with my pack and camping stuff in the back, I headed west toward the looming Rockies for a world of the west I had seen before only on the wild west screen and in National Geographic magazine. The drive-away company gave me twenty-four hours to make it to Ogden, Utah 525 miles away. What excitement! At Red Rocks, an outdoor theater above Denver, I stopped briefly to admire the wind-eroded sandstone turrets and went on over the Berthoud Pass eventually finding a dirt side road which permitted me more or less to conceal the car, my metal tent, for the night. In the fading light I cooked supper on the little Primus on the tailgate and settled in to sleep feeling uncommonly adventurous. I did make it in one day to Ogden but it was a long haul without much time available for stopping. Rabbit Ears Pass was, according to the signs, closed and so I rerouted myself via Taponas and Oak Creek to Steamboat Springs. Along the way were mountains whose aspen-covered slopes almost glittered in the sun their silver leaves shivering in the breeze. I passed isolated sentinels of stone wondering the while whether they had been ever climbed and imagining myself, triumphant on their tops, coiling the rope and hurling it in loops and swirls into the void for rappel. From here it stretched still two-hundred miles to Ogden on the Great Salt Lake but at last in the early evening I began to descend toward the valley, at one point I passed a strange geological feature noted as Devil’s Slide. It comprises two huge walls of harder rock, separated by about ten feet, and left higher by erosion than the surrounding sandstone, rising out of sight over a rolling hill like the parallel rails of an immense prehistoric railroad or roller coaster. At first the drive-away man in Ogden refused to pay me for the gas but after a prolonged argument over the contract he agreed and I made my way to a hotel where they showed me to a shabby room in back on a high floor overlooking the Wasatch Mountains. I cooked supper on the dresser while watching a spectacular play of lightning over the mountains from a storm receding eastward into the night. At Rock Springs I changed to a bus for Jenny Lake in Grand Teton National Park. My seatmate told me his name was Bill Buckingham. We talked some and only months later did I find that he (and his father) were Teton mountaineers of some note. In the darkness at Jenny Lake campground, having seen nothing yet of the spectacular scenery around me, I found a site and set up my little army surplus poplin two-man tent. If you have no climbing partner you put a note on the bulletin board at the ranger station and wait until somebody shows up. I spent a beautiful day in awe of the panorama of high peaks to the west and took a boat ride across Jenny Lake. I bought Leigh Ortenburger’s Teton guidebook and set about getting my bearings. At suppertime “Tink” Thompson appeared—graduated from Yale in June, a former summer ranger with some Teton experience, and with three days of vacation remaining. Tink wanted to do the East Ridge route on the Grand Teton, highest peak in the range. And so, after having exchanged the obligatory half-truths on relative mountaineering experience (of which I had none whatever) we agreed to hike to Amphitheater Lake (9,700 ft) to do a reconnaissance and to see how we would work out as a climbing pair. Tink wanted to view the ridge from the Teewinot summit (12,317 ft). The long summer evening lingered. The floor of Jackson Hole expanded into the distance three-thousand feet below us its flat expanse punctuated by the outcrop of Blacktail Butte. The glacial lakes gleamed in the dark under the fading light of dusk the Wind River range barely outlined far to the east. I suspended belief that I could really be here but not without some apprehension about what might be in store. While cooking cereal and making coffee at dawn Tink abandoned his Teewinot plan and opted to do Disappointment Peak (11,600) instead. Disappointment rose directly above us, accessible via the snow filled couloirs in the headwall of the cirque that cradled the lake. (I have no recollection of whether or not I had an ice axe for this climb. Certainly at that time I did not own one.) In a few hours we sat on the summit pinnacle from which the east ridge of the Grand spread out before us in all its detail as though in a great photographic enlargement in place on an easel. Tink sat gazing at the route for the better part of an hour, making notes in his Ortenburger, and naively inviting me into speculation about its possible intricacies and difficulties. At the cave that evening we decided to attempt the East Ridge route the next day. We would rise and go in the darkness well before dawn—a traditional “alpine start.” The night was muggy, oppressive, and the mosquitoes frightful. Near the hour set we were awakened, not by our alarm, but by a crash of thunder followed by a storm of lightning, torrential rain, and wind that persisted well into the coming of first light thus making our predawn start impossible. Owing to the known length of the route we had to abandon the ascent and, after breakfast in rapidly improving weather, we packed up and headed down. Tink had no more days of vacation. We drove into Jackson and treated ourselves to drinks and a steak dinner. The next day my notice yielded an Irish professor of physics, Philip Gribbon who had just learned that his wife was pregnant. They were en route to the east coast from Vancouver—where he had enjoyed an exchange professorship for a year—now seeing America and climbing along the way. He was secretary of the Irish Mountaineering Club and hoped to climb the Grand Teton. Did I know the area? Did I know anything about good routes? Why, yes! I am somewhat familiar (at least from a distance) with the East Ridge. And (my close familiarity such that) I happen to know of a cave we can use to obviate the necessity of carrying a tent. And thus we decided to do the route that Tink had so hoped to have done two days before. We realized that I would need an ice axe and since Margo could not climb (Phil’s orders) I gained the use of hers. The cave was, as before, a trial but we bore its tortures and rose before dawn to a calm, star-filled sky. By the time we had completed the descent into the great couloir between Disappointment and the huge mass of the East Ridge it had become daylight. The granite wall above facing the rising sun glowed orange and gold above us. We climbed the terminal moraine of the Teton glacier to gain the foot of the ridge and from there could clearly see tiny Delta Lake far below—made powder blue by its burden of glacial rock flour. We looked up. The route looked like a “piece of cake” to our unseasoned eyes. We fairly leapt upon the wall. Roped but moving together, at first we progressed rapidly but slowed somewhat as the guidebook route description seemed less and less to resemble the maze of cracks, slabs, chimneys, and dierdres we saw endlessly before us. The physical scale of these features loomed so huge compared to those we knew and proved so inadequately covered by the few puny phrases in the guidebook that, at first, we felt overwhelmed. In a world without cairns or blazes Phil proved a master route-finder. Through his analysis of the terrain we recovered from more than one inadvertent detour. At one stage Phil led us down and to the left (rather than up and to the right as seemed evident to me) successfully to place us in a rocky couloir capped by the largest chockstone in the Tetons according to my friend Bob Larsen. Obviously we had returned to the route having traversed the base of the Molar Tooth, a prominent sentinel on the ridge. There we lost several precious minutes searching unsuccessfully in crevices for the strap to Phil’s axe which had slipped from his axe and wrist. Having climbed the chimney formed by the right (east) side of the huge boulder (bigger than a large house) we crossed over its upper reaches and confronted our first really “technical” obstacle—a steep wall about ten meters high; class five but only of moderate difficulty. I had the more rock experience (and Phil the more on ice and snow) so the one pitch lead fell to me and we climbed it in a few minutes. There followed more and seemingly endless class four pitches above which loomed the most prominent feature on the ridge—the Second Tower, to be skirted on the right above the precipice, now more than two-thousand feet to the Teton glacier below. Time had passed—it had advanced to 2:30. Getting late. We climbed into the afternoon too naive even to have discussed the possibility of a “turnaround” time. We heard the distant grumble of thunder and looked up, almost for the first time, to note clouds stealing in from Idaho to the west. Only minutes later we knew we faced a major thunderstorm and scrambled to find an overhang or a rock for shelter. The storm came on, fast and booming. Crouching in our quasi-cave we saw the Teewinot summit directly opposite us and at about the same elevation several times struck by multiple bolts of lightning. It rained, we put on our light parkas and managed to stay relatively dry. The clearing of the storm, as such things often prove, was glorious. The sunlit pinnacles emerged from the dark clouds; the thunder faded into the east over the valley; great gray sheets of rain slanting down to the valley floor from the overcast. We had lost an hour. But we had gained enough height to see the lower edge of the steep summit snowfield above us. This patch of snow appears plainly visible from the valley. The air had become cooler and noticeably thin and we moved slowly and with great heaving breaths. On the snowfield it became a case of one or two steps (we were woefully unacclimatized), then stop, deep breath, plant axe, and kick another couple of steps in the snow. Phil shivered with cold; he had on only a pair of shorts. I felt better off in long pants. We huffed and puffed slowly upward. The slope seemed steep, exposed, endless. A slip here, as I would learn a few hours later, would have proven fatal. At last we came again to rock and safer going. Soon then signs of the passage of booted feet; then a short steep but easy wall littered at its base with candy wrappers, rusty sardine cans, and cigarette butts. Up this; a few more steps and we reached the top standing on the Geodetic Survey marker (13,770 feet above sea level), the world at our feet, and a vast, yawning view in every direction. It was five-thirty. Sign the register; take a couple of photos and it’s then time to head down. Down the backside, down the Owen Spaulding route at least as far as the Black Dike on the Idaho side. Down as far and as fast as we could in the waning light. 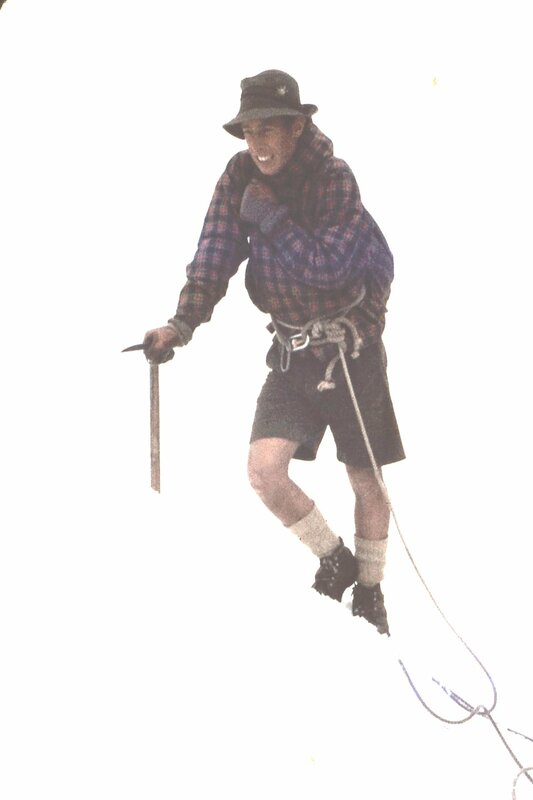 Phil led us unerringly to the first rappel and then to the top of the famous Owen rappel almost by divination. We had two 120 ft ropes so we knew we could reach its bottom even though it was unnervingly out of sight owing to the huge overhang of the wall at our feet. We tied the rope ends together at a mass of old laid rope slings and each of us in turn launched himself over the edge and into the void. About halfway down the wall arched under leaving feet in the air and body slowly twisting in the air until the welcome touchdown at the Upper Saddle just as the rope ran out. Quickly. Recoil the ropes. Onward and downward. With Phil in the lead we hastened southward seeking the long east-west dike of dark basalt which cuts completely through the Grand to the south of us. It marked the place finally to turn left and east again to find a long chain of snow couloirs descending to Teepe Glacier and beyond into the great chasm between Disappointment and the Grand. Phil came through again and we arrived at a narrow notch in the ridge from which a steep snow-filled gully descended into the depths at an angle of fifty degrees or so. We roped up. “Do you know how to glissade?” asked Phil. “Do you know how to do self-arrest (with the axe)? No? Well, you roll your shoulder over onto the pick like this and press it into the slope to stop the sliding. As for the glissade watch me,” whereupon he skied off on his boots, dragging his axe point behind him for balance in the snow as I paid out the rope—all 120 feet of it. He vanished downward into the gathering gloom. When the rope took up he stopped and called up for me to come on down. This worried me a little because, if unable to stop a fall, I faced a 240 foot slide. I started out and, inevitably, I lost it after a few feet. My self-arrest proved ineffectual and I shot off feet first and then head first gathering speed rapidly. I must have rocketed past the horrified Phil at about thirty miles per hour with yet another 120 feet to go. Suddenly the surface changed from corn snow to snow and dirt, to dirt, the dirt to pebbles, and the pebbles to stones and rocks just as the rope took up with a jolt. Immediately ahead I saw jagged, killer boulders. My shirt, pulled from my pants, was completely stuffed with snow, mud, and gravel; I had painful raspberries on both arms; my ribs hurt; I was shaken but thankful that the rope had not been ten feet longer. Night had come. Darkness fell. The flashlight I pulled from my knapsack was, of course, dead; on all day long in the pack. As Phil had none it was to have served as our only light. In starlight the snow gleamed faintly below us beyond the black of the rocky island of which more protruded from the snow below us at intervals along the route. The time had come to operate by the rules. On the descent the leader (the most experienced) goes last. I would go first, belayed, followed by Phil whom I then belayed in turn but who had sufficient skill never to have any trouble zipping down on his boots. Then, inexplicably, dawn seemed imminent; there seemed a slight lightening of the snow and then miraculously, beyond a rocky defile, low in the sky, a truly immense and glorious full moon rose to meet us headlong over the Wind River Range! Almost joyfully then, and for hours we played on down the seemingly endless reaches of steep snow until we came under the shadow of the immense wall of Disappointment Peak at the point to re-ascend the steep and rocky trail, now in darkness, to our cave at Amphitheatre Lake. We had moved without rest for seventeen hours; it was half after midnight. I wanted only to crawl into the cave and sleep but Phil insisted that we pack up and go on down as he had rashly promised Margo we would have been back by dinnertime. We took some time to cook and eat our remaining food then packed up and headed down bathed in legendary moonlight. It was near dawn and the moon had set below the peaks behind us when we limped into Lupine Meadows to find Phil’s car and return to the campground. In the morning (about 3:00pm) we cleaned up a bit, and had Margo take a victory photograph (shouldered ropes, open guidebook, crossed axes, etc. ; really tacky). People talked of a comet visible in the western sky and by walking and running some distance east out across the prairie we raised it over the mass of the darkening mountains. A beautiful comet suspended, its long tail glowing, in the deepening purple of the evening sky. Comet Mrkos, as I recall. We drove into Jackson for my second round of drinks and steak. We toasted. In some sense, at least, I had become a mountaineer. The East Ridge, I later learned, is not often done owing to its length and to its route-finding difficulties. Some forty years later Jim (“Bobo”) Burwick, an Exum Guide, showed me a book, Ascents of the Grand Teton by Leigh Ortenburger. In it I found that we had made the 47th ascent of the route—the “oneth” having been made by our own Kenneth Henderson, et al, in 1929. Until 1957 at least, it seems to have been done, on average, about once every two years. Some ten years later (and not having been in any way a JFK conspiracy buff myself) I read a long and detailed article in The New Yorker magazine about the tenacity and dedication of the conspiracy theorists surrounding the assassination of President Kennedy. It concerned mainly a new book “Six Seconds in Dallas”. The book’s author: Josiah “Tink” Thompson. Nov. 2017: I have just received the following link from my daughter who dabbles in such things (re Philip Gribbon): the Polar Medal.